A series of caldera forming eruptions took place along the Alaska Peninsula and in the Aleutians following the end of the last great ice age. Fisher Caldera is the largest of these eruptions, forming a 11 x 18 km elliptical caldera. 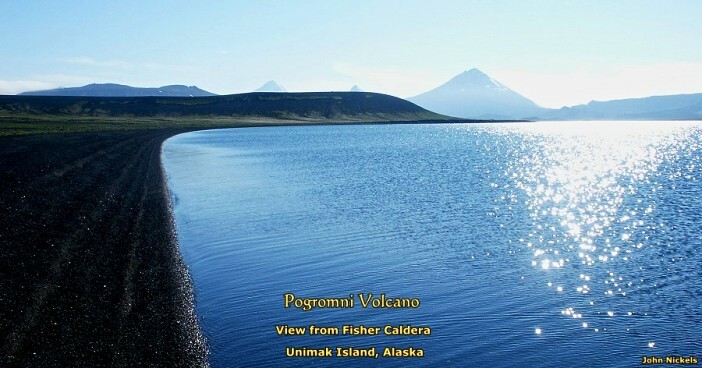 Is one of at least three volcanoes on Unimak (not to be confused with Umiak) Island. Two volcanoes to the west are Westdahl and Pogromni. They share the same edifice at one end of the island. Fisher sits in the middle of the island. To the east of Fisher we have the active Shishaldin, Isanotski and Roundtop. The last three share to some extent the same edifice. Shishaldin is some 1,100 km SW Anchorage. Unimak Island is the easternmost island of the Aleutians. It is just under 4,070 km2 in area with a population of 35, all of them in False Pass, a fishing town at the eastern end of the island. Climate is cold, windy, rainy and snowy. The ocean does not generally freeze during the winter, it does not get much above 50 F during the height of the summer. The island was declared a wilderness in 1980’s ANILCA. It is managed by the US Fish and Wildlife Service. The coastline has steep cliffs and islets. There are wetlands onshore. The island is breeding grounds for waterfowl and other birds. It also supports brown bear, caribou, wolves, wolverine, and marine mammals. Scotch Cap Lighthouse was built on the SW corner of Unimak Island in 1903. It was a 14 m wood tower on an octagonal wood building. The lighthouse provided some protection for fishing and cannery traffic. It was manned by crew of five Coast Guard. A massive earthquake struck the Aleutians 145 km south April 1, 1946. It has since been classed Richter 8.6 – 8.1 magnitude. 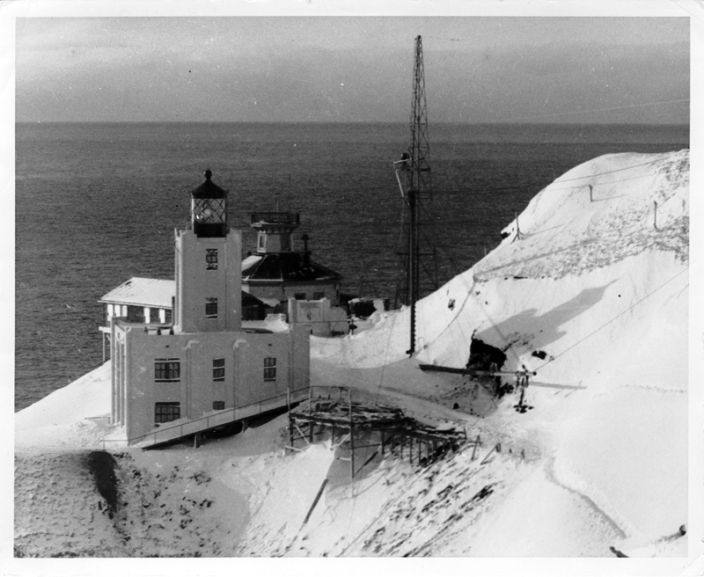 The second of two jolts put at least a 30 m tsunami onto the island, destroying the lighthouse and killing the men. The tsunami was likely higher than that as a crewman sleeping in a building some 30 m above the light was awakened by the earthquake and water in the building. Tsunamis from this earthquake killed 159 in Hawaii, drowned a swimmer in Santa Cruz, CA, damaged fishing boats in Chile, and destroyed a hut in Antarctica. I was not able to find any reports of volcanic activity connected to the quake. Fisher Caldera is named after a young geologist, Dr. Bernard Fisher who lost his life doing fieldwork in the Aleutians in 1946. He and two US Army members investigated an island called Ship Rock off the eastern shore of Umnak Island and Okmok Caldera in July 1946. The boat was found several days later with no survivors. The lead geologist on that trip named the previously unnamed caldera on Unimak Island after Fisher. Like we saw with Bogoslof, it is possible to monitor activity on unmonitored volcanoes by triangulating activity with nearby sensors. 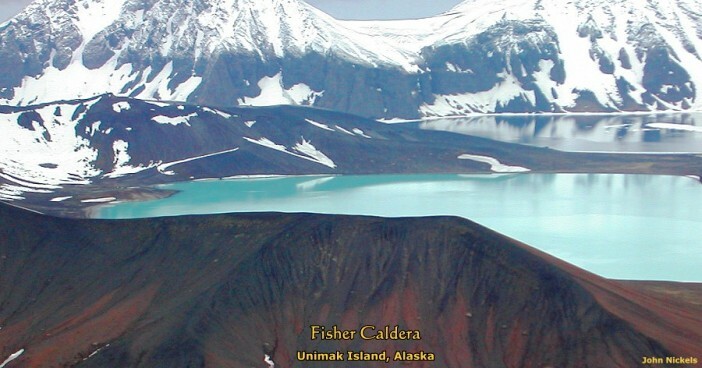 Fisher caldera is at the geographic center of Unimak Island. It is a complex of multiple stratovolcanoes covering some 650 km2. There were at least eight pre-caldera stratocones, all of which were partially destroyed during the eruption. The largest of the remaining cone is Eickelberg Peak, which forms part of the caldera wall. There are gentle slopes between the peaks that have been partially buried by pyroclastic flows, ash, phreatomagmatic and debris avalanche deposits. Eroded lava flows are found outside the caldera. They are the oldest features of the volcano dated at some 660,000 years old. As far as anyone has been able to find, there was no single, massive stratovolcano occupying the future caldera. Today, the caldera is partially filled with lava flows, tuff cones, cinder cones, and other deposits. The caldera rim stands 100 – 900 m above the caldera floor. The caldera walls expose interiors of several pre-caldera stratocones, lava flows, pyroclastic flows, debris flow and scoria deposits emplaced early in the history of the volcano. 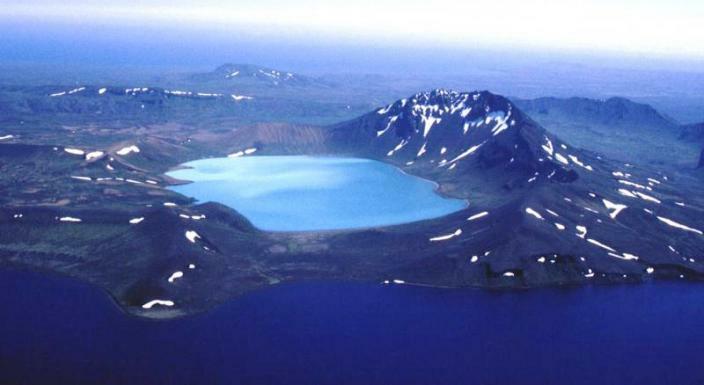 Three lakes are currently present inside the caldera. There is a single post-caldera stratocone and ridge to the NW outside the caldera. Nearby, there is a cluster of three cinder cones and a lava flow that extends 9 km to the southern coast erupted after the caldera eruption. Two large stratovolcanoes Turquoise cone and Mt. Finch grew inside the caldera after the caldera forming event. Each has multiple ash, ballistic and lava flows. At least 15 monogenetic vents are located in the northern part of the caldera. Activity in the vents within the caldera generally migrated to the north. Fisher developed in four periods. The first dated 660,000 – 250,000 years ago emplaced various basalts and built two of Fisher’s pre-caldera stratocones, #6 and #7. Note that the numbering of these cones are not connected to their age. These two cones were located in the eastern portion of the pre-caldera region. These cones had small, independent magma reservoirs. There was a 5,000 year period of relative quiet after these cones were built, though cone #5 may have been built toward the end of this period as its age is uncertain. Estimated pre-caldera eruptions produced total volumes in the 80 – 90 km3 range. Total post caldera erupted material is estimated at around 8 km3. There is a 2001 paper by Bindeman, et al that suggests a second, earlier caldera forming eruption to the north of the current caldera. There was a flurry of volcanic activity beginning 40,000 years ago. During this, activity shifted to the western portion of the system. It initially built cones #8 and #5. Shortly thereafter, activity began to build the western caldera stratocones. Progression of this cone building and chemical differences in the erupted magmas tend to support the notion that this system is driven by multiple, individual compositionally distinct magma reservoirs. 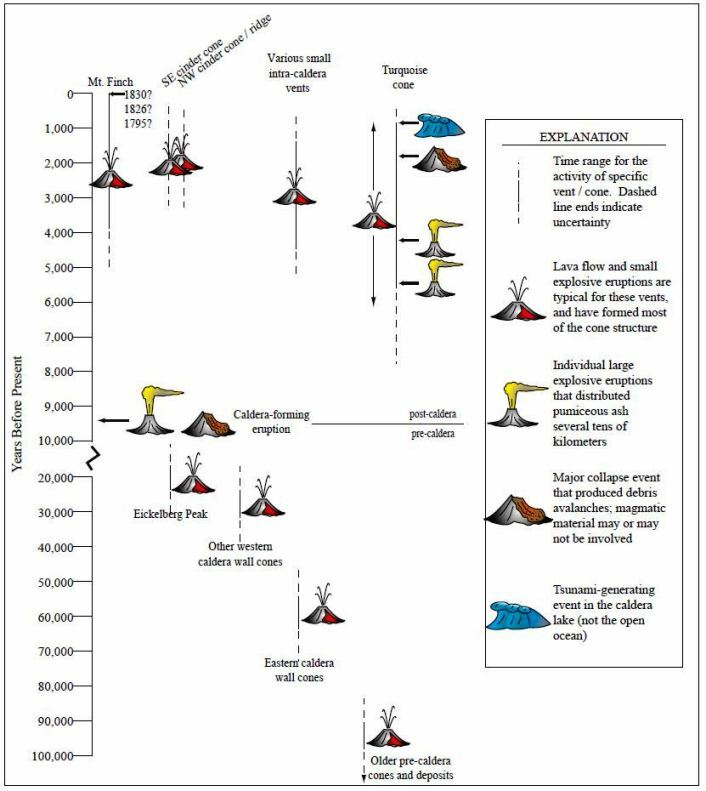 Magma evolution modeling suggests that the evolution / mixing of eastern magmas cannot produce what the western cones erupted and similar evolution / mixing of western magmas cannot produce what eastern cones erupted. This modeling supports the notion that distinct magmas erupted at different points in the caldera. That difference still exists as demonstrated by different magmas out of Turquoise Cone and Mt. Finch, though the reason may have changed. Activity from the western cones migrated from SW to NE over time. Cone #1 erupted basalts and andesites. It is the first cone in the western sequence and was cut in half by the caldera collapse. It was similar in size to cone #4, Eickelberg Peak. Cone #2 erupted basalts and was almost completely destroyed by the caldera collapse. Cone #3 is north of cone #2. The SE quadrant was removed by the caldera collapse, exposing layered lavas and breccias, and multiple dikes that formed the central conduit. Lavas of cone #3 are basalts and basaltic andesites. Cone #4, also named Eickelberg Peak is the largest and youngest remnant of the pre-caldera system. It is composed by numerous lava flows and few overlying breccias. It is built on top of highly weathered lavas. It has been dated near zero age, similar to that of cone #3, confirming this part of the pre-caldera system was the youngest. Cone #5 and #8 were among the first cones to develop starting some 40,000 years ago. Cone #4 is built on the remnants of Cone #5. The northern caldera wall has remnants of cinder cones, breccias and dikes. These were exposed by the caldera collapse and wall erosion. Cone #7 erupted the most mafic magmas. There is some rhyolite present in an exposed dike in the northern caldera wall. That dike dates around 17,000 years. It is located outside the modern caldera. Cone #8 is mostly destroyed. It was slightly smaller than cone #4 and was located slightly apart from the cluster of cones in the NW pre-caldera region. The lava flows date around 38,000 years, and may have been the first to form in the western cone cluster. Western cones produced a wide array of erupted magmas. Dacite was erupted from cone #8. During this time, #6 and #7 were inactive. There are several andesitic pyroclastic flows prior to the caldera forming eruption, indicating the caldera system became increasingly violent as it approached the big eruption. The oddity of Fisher is the occurrence of dacitic magmas in a region dominated by basalts and andesites. Rhyolites and dacites erupted at least seven times over the past 82,000 years. Time spans between silicic eruptions appears to be getting shorter, most recently 4,500 years, with the last eruption 3,000 – 6,000 years ago. Dacite eruptions appear to be separate events rather than eruptions from a single, long lived magma body. Two new stratocones were built after the caldera-forming eruption. The oldest of these is Turquoise Cone. Mt. Finch is the youngest. They are located in a line along the center of the caldera floor. Neptune Cone is an isolated stratocone outside the caldera to the NW. It was built sometime after the caldera forming eruption. There was a much more recent fissure eruption. Both are undated. There is a broad, low mound of cinders and lavas some 2 km NE of Mt. Finch. This is called the Eastern Mound and has produced andesites. AVO writes that “The caldera is remarkable in size … and for the mobility of the ash flows that resulted …” The caldera forming eruption took place some 9,372 years ago. Ash flows reached the Pacific Ocean to the SE, swept part way up the slopes of neighboring volcanoes. 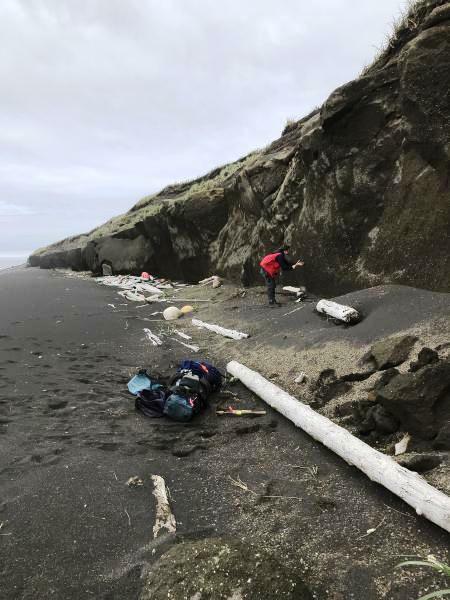 To the north, the ash flows flowed over drainage relief as high as 400 m above the lowlands and swept an additional 8 km to the Bering Sea shoreline. The velocity and mobility of the pyroclastic flows is thought to be due to collapse of an unusually high eruption column. Total output from this eruption is thought to be in the neighborhood of 100 km3, though that output may range 50 – 115 km3. 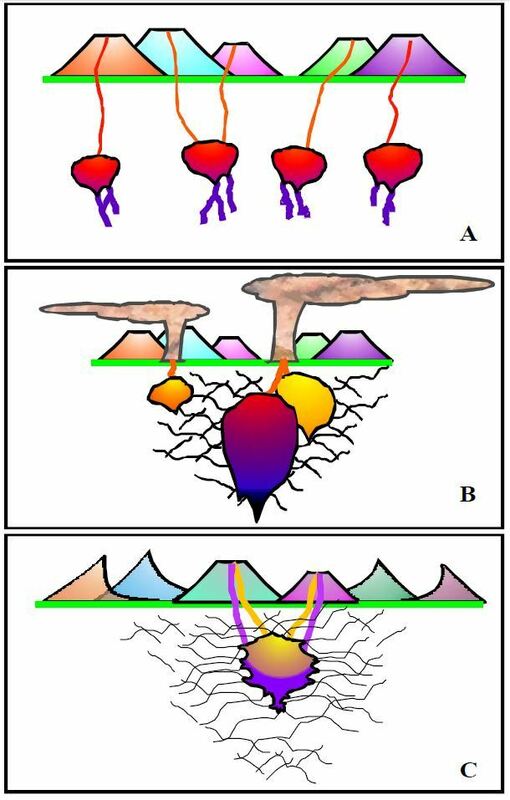 The caldera forming eruption erupted three chemically distinct magmas. At least two of them appear to be chemically independent of the pre-caldera magma system. 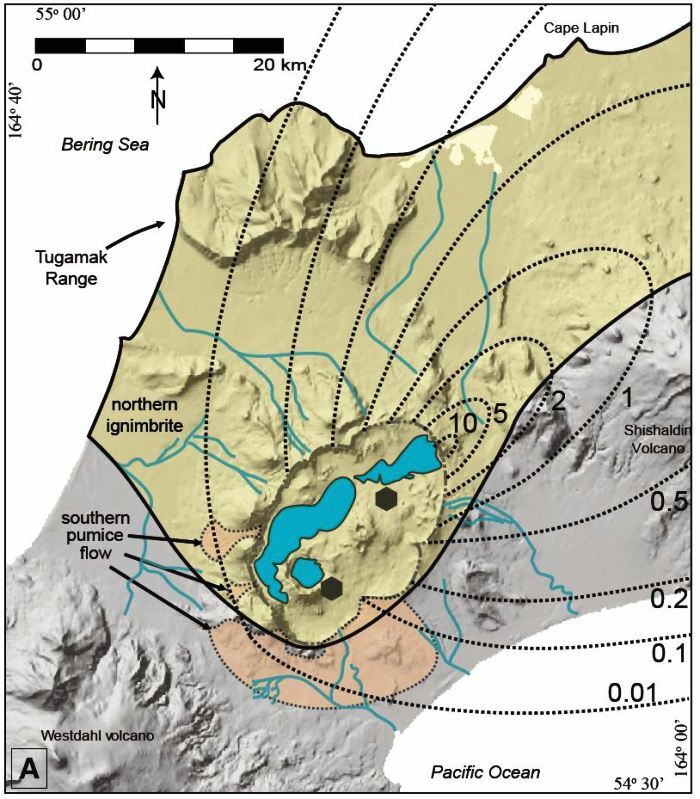 While there is no evidence of multiple caldera collapse events at Fisher, at least one paper proposes the Tugamak Mountains to the north as the remains of an earlier caldera. There are no ring faults outside the caldera, which argues against this theory. Scalloping of the caldera rim is thought to be caused by erosion flow into the caldera and lakes. The rim has migrated a kilometer or so outward over time, giving original dimensions 8 x 16 km. Volcanic activity continued in the caldera after the eruption. 6 m of lake sediments indicate an extended period of quiet before eruptions resumed. 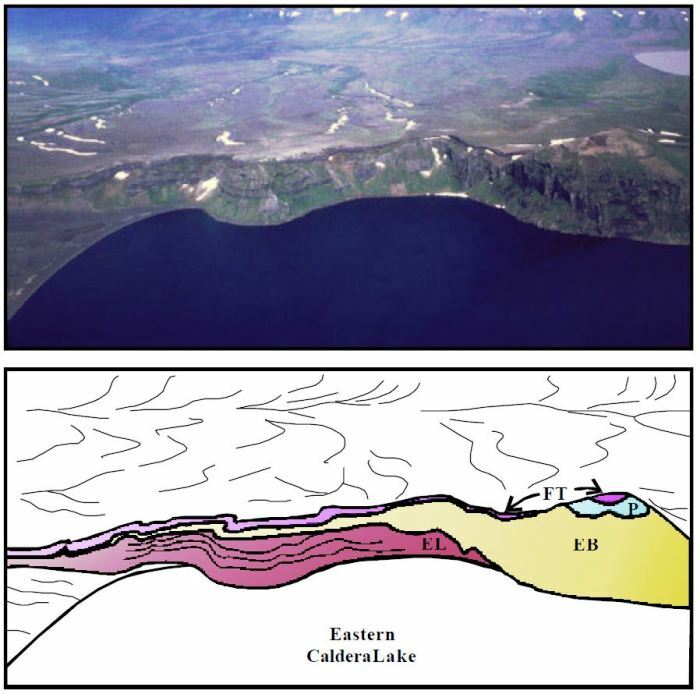 The large lake completely filled the caldera to a depth of at least 100 m. Lake sediments have at least 25 ash and scoria layers associated with eruptions from Fisher or neighboring Westdahl and Shishaldin volcanoes. Turquoise Cone (3 – 4 km3 estimated volume) was significantly larger than that of Mt. Finch and is located in the western portion of the caldera. The modern Turquoise Cone is thought to be about a third the volume of the original cone. It collapsed some 5,100 years ago creating an amphitheater. This collapse may have been one of a pair of explosive eruptions that put nearly a meter thick deposit of coarse pumice 15 km away. One of these eruptions deposited a 3 cm layer of ash and pumice 120 km to the NE. A lava flow from these eruptions buried the entire western half of Turquoise Cone under at least 5 m of lava. The flank collapse of Turquoise cone removed perhaps 2 km3 or half of the original volume of the cone. Its erupted magma evolved over time becoming more silicic. Mt. Finch is younger than Turquoise Cone, though its activity looks to have overlapped with that from Turquoise Cone. It may have had a partial summit collapse. Pumice fall deposits from Turquoise Cone are not found on its flanks, meaning that its eruptions covered Turquoise pumice deposits. There are several small monogenetic eruption centers and cones on the flanks of Mt. Finch. Deposits from a 4 km2 field of small cones cover the region between the two stratocones. An explosive phreatomagmatic eruption from the collapsed Turquoise cone 1,500 years ago generated a tsunami in the caldera lake. This left tsunami deposits around the lake. 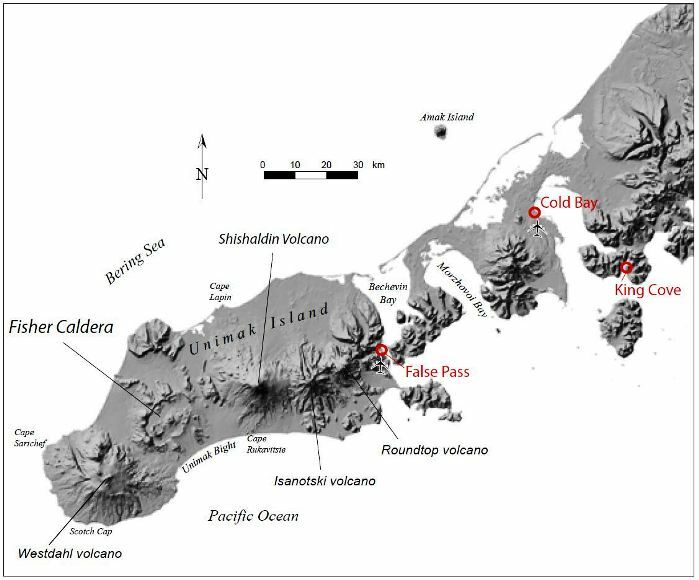 Additional tsunami wave deposits from following phreatomagmatic explosions are present at the north shore of the western caldera lake and the isthmus between the lakes. Waves washed over the top of the caldera rim and lifted cobbles to the top of the caldera wall. The tsunamis eventually breached the caldera rim and catastrophically drained the original lake to the south. There is a complex of three cinder cones outside the SE caldera. They sent lava flows south toward the Pacific. One of these is 9 km long, 1 km wide, and 15 m thick. These cinder cones along with Neptune Cone are the only relatively recent activity outside the caldera rim. There is also lapilli from an intra-caldera maar on the lava flows suggesting the two eruptions took place at similar times. Phreatomagmatic eruptions are frequent at the volcano since the caldera forming eruption. There are at least three known maars in the caldera with several others suspected. These produced surge deposits and lapilli fall deposits in places over 100 m thick outside the caldera. Over 450 km2 are covered by these deposits. 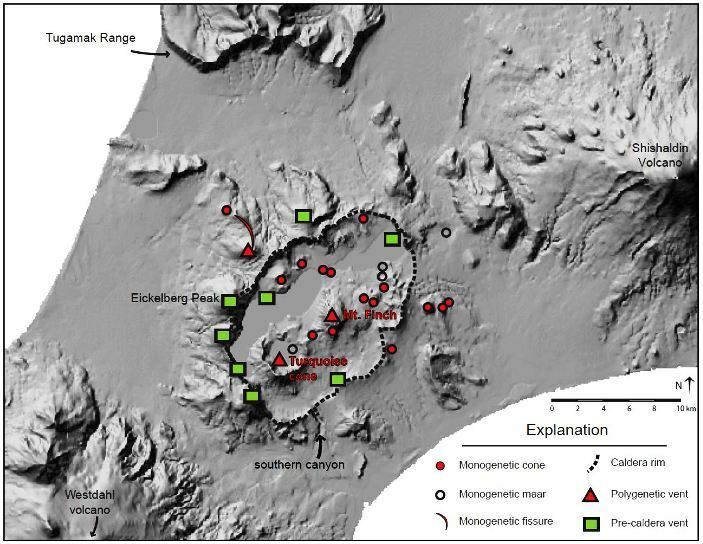 Magmas for the post-caldera structures are generally basaltic andesites. 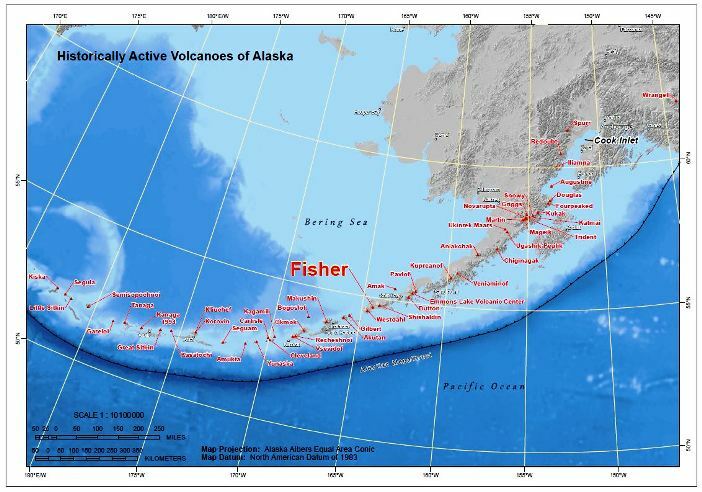 Native Aleuts probably observed thousands of years of eruptions from Fisher. 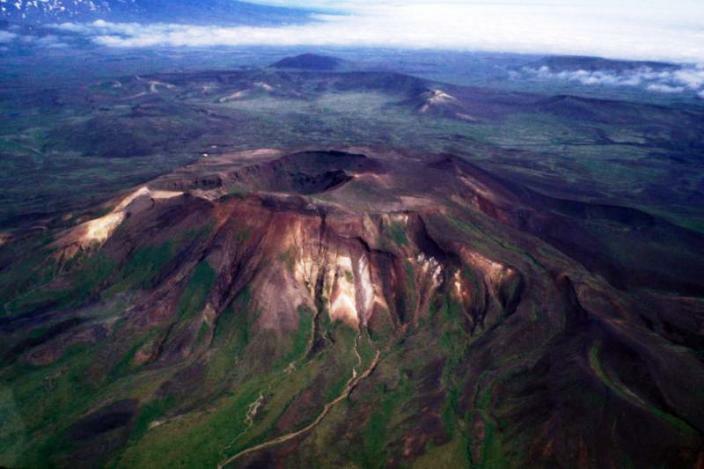 There are only three historic reports for eruptions from this volcano – 1795, 1826 and 1830. Several papers call the 1826 the most recent. 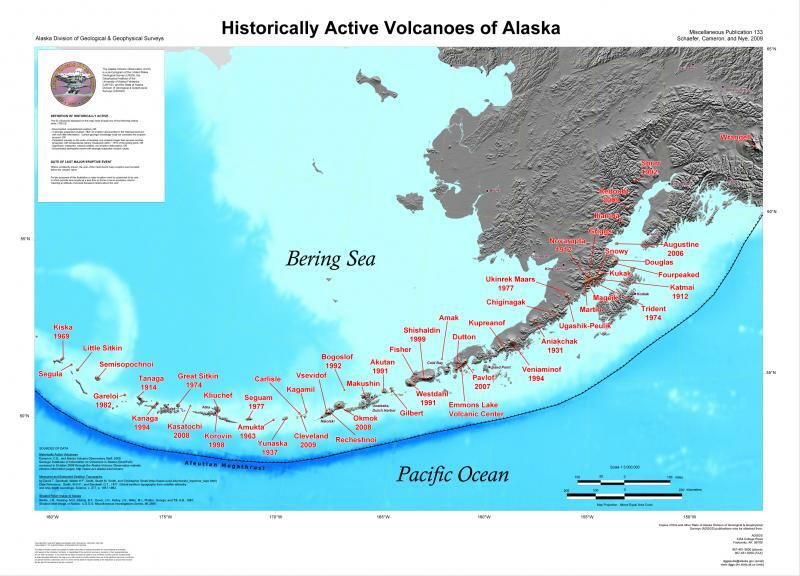 Activity from Shishaldin and Westdahl, both historically active neighboring volcanoes may have been misidentified as coming from Fisher, the 1830 eruption is thought to have come from Mt. Finch. There are several hot springs active in the SW part of the caldera. Turquoise Lake has active upwelling of warm water and frequently emits strong Sulphur smells. The intensity of the hydrothermal system in Turquoise Lake varies over time, with thermal plumes appearing and disappearing over the course of a year or so. This system is classified as active. The hydrothermal system generates strong sulfurous fumes. There is some confusion about the current structure of the magma reservoir underlying the system following the eruption. On one hand, I have found a conclusion stating that there appears to be more than one magma reservoir present under Fisher, as the Turquoise Cone magmas and the Mount Finch magmas cannot both come from the same source. On the other hand, the caldera forming eruption destroyed the previous subsurface magma chamber structure, leaving a single chamber that is periodically recharged and evolves over time. I have not as yet found anything that reconciles these two conclusions. The caldera forming eruption 9,372 years ago produced three separate deposits distributed around the caldera. It is classed as a VEI 6 eruption with a plume 20 – 25 km tall. 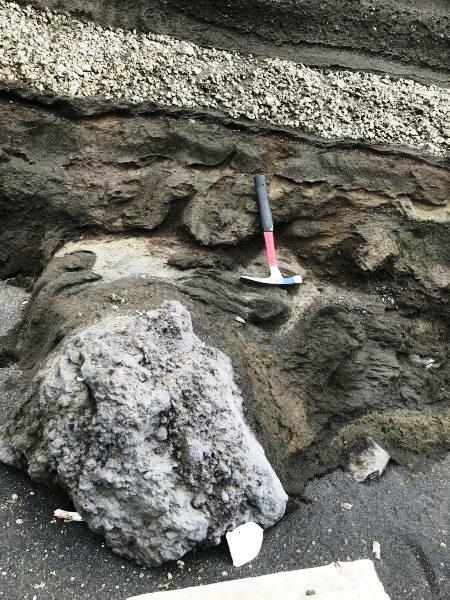 The eruption began with a column that produced thick dacitic pumice and ash deposits generally deposited to the north and east, 10 m thick in places. The most distant deposit is 12 cm thick, 120 km to the NE near Cold Bay. The phase was vertical with significant wind shear to the NE. Its source vent is thought to be a few kilometers from cone #6. The northern dacite produced layers with a distinct boundary between the layers. The lower 2/3 are a lightly pink pumice with relatively constant clast sizes. The upper third is light gray and has much coarser pumice clasts and rock size. The two layers are chemically similar. It is possible that the upper layer color change is due to welding by overlying pyroclastic flow from the second phase of the eruption or increased oxidation in the lower layer. Two distinct magmas were erupted to form the northern ignimbrite – a basaltic andesite and a dacitic magma. Chemical and crystalline analysis suggest that the two magmas were physically separated until immediately before the caldera forming eruption. Before the first plume diminished, the second phase of the eruption generated a large pyroclastic flow that traveled primarily to the north. It traveled more than 20 km, flowing over a 500 m high neighboring mountain range. This was the largest deposit in volume and mingled dacite and basalt. Deposits 30 m about 25 km away on the northern coast, meaning a significant volume of pyroclastic flow was deposited in the Bering Sea. Deposits 32 km to the NW are more than a meter thick. This flow may have come from the source of the dacite pumice plume, though it had a variety of juvenile products, more mafic than the pumice. Portions of this flow are banded. The third phase produced a separate southerly pyroclastic surge leaving deposits more than 3 m thick up to 6 km outside the SW corner of the caldera. This flow appears to be associated with collapse of a pre-caldera volcanic structure. This flow was also dacite, though the composition suggests a second vent in the SW portion of the caldera was opened. This dacite may have been produced some time before the caldera-forming eruption (less than 1,000 years). The deposit sits on glacial till from the last ice age, nicely constraining the date of its eruption. This is the smallest deposit in terms of volume and is chemically distinct from the two northern deposits. All three deposits can be separately identified by their chemical differences. There are banded pumices present in the northern pyroclastic flow demonstrating magma mixing immediately before or during the eruption. The northern dacite appears to have come from a source in the NE portion of the caldera. Degree of welding of the ignimbrite decreases with distance from this location. While it is possible the northern pumice and the ignimbrite erupted from the same source, the geometry of ignimbrite suggests a partial ring fracture source for the deposits. The problem is that there is no evidence of a ring fracture system, so that the actual northern source is uncertain. The source of the southern ignimbrite was around 4 km inward from the SW caldera rim. There is a significant discrepancy between estimate volume of the caldera collapse at 100 km3 and the estimated volumes of the three deposits at 12 km3. The estimate of the northern ignimbrite is a minimum as a substantial portion of it went into the Bering Sea. Ignimbrite thicknesses do not necessarily decrease linearly from the source. The base of deposits on the near side of the Tugamak Range has not been found. Remaining deposits have been poorly mapped. Finally, the 100 km3 estimate is based on original caldera geometry. The southern dacite is not related to any other pre-caldera magma. Its source is thought to be a small, independent magma reservoir. This reservoir was emplaced just before the caldera forming eruption without prior eruptions. This portion of the eruption may have taken place just before the main eruption or triggered due to the activity of the main eruption itself. The northern magmas were two large batches that entered the system immediately before the eruption. There is no genetic relationship between any pre-caldera magma and these two magmas, meaning they were independent of existing pre-caldera magmas. The introduction of these two magmas into the system destabilized the system, which quickly fractured and erupted. The northern portion of the eruption began with the eruption of the newly arrived dacite. This began as a Plinian eruption that partially drained the dacitie reservoir. The dacite and basaltic andesite magmas mixed a bit enroute to the surface. As the mix reached the surface, the vertical plume changed to a northerly oriented pyroclastic eruption. As this drained the reservoirs, it destabilized the pre-caldera structure which collapsed. Post-caldera eruption products do differ in composition, but these differences can be explained by magma mixing or complex crystallization. The post-caldera system is thought to contain a single reservoir being continually recharged. The ash flow to the north from Fisher was highly mobile. It filled deep valleys enroute to the Tugamak Range 15 km to the north. 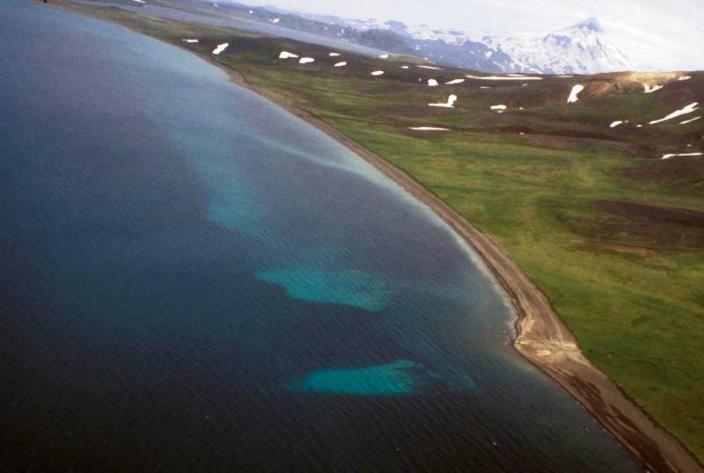 This range is 700 m high with passes at 500 m. Some ash flows may have been partly diverted into an E – W flow, but the majority of the flow went up and over the range, flowing into the Bering Sea to the north. 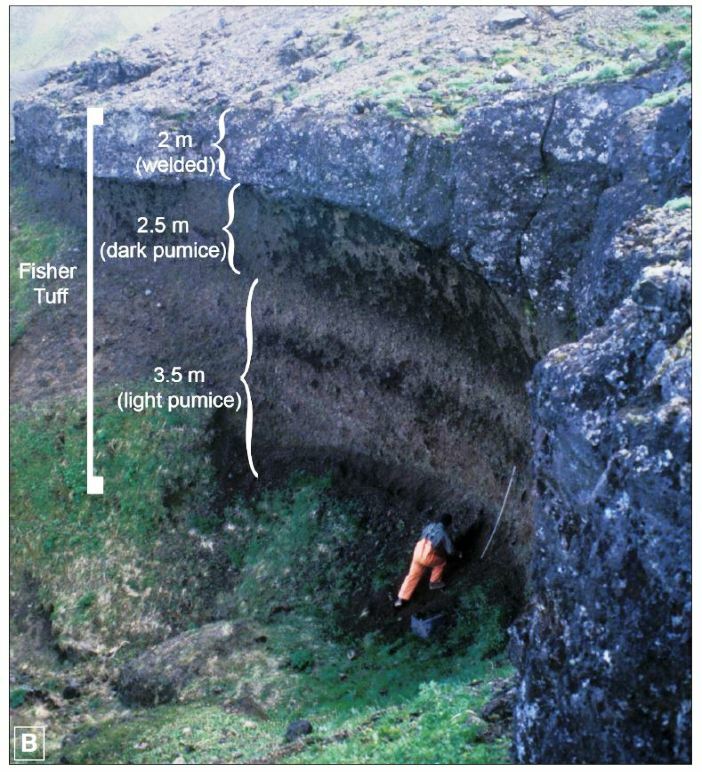 Tuff thicknesses tens of meters is found from at least 330 m down to sea level on the south side of the range. Similar thicknesses can be found from 200 m down to sea level on the northern side of the range. This suggests that the pyroclastic flow went up, over and down a 500 m barrier without slowing down. Final oddity about the Tugamak Range. Its existence is something of a problem. At least one paper suggests the range itself is remnant of a previously destroyed caldera rim. Another possibility is that the range is a fault scarp. Problem with this is that there is no sign of post-eruption uplift along it. 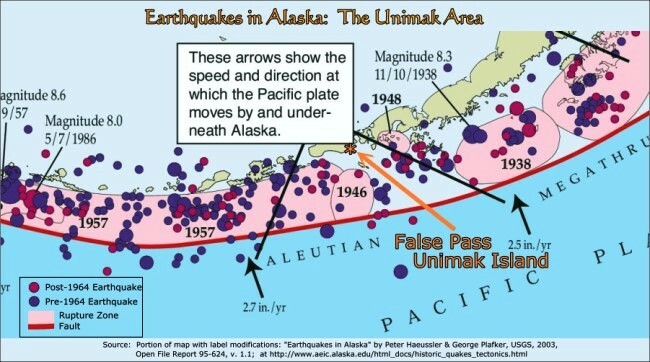 As with the Alaskan Peninsula and Aleutians, volcanic activity on Unimak Island is driven by the subduction of the Pacific Plate under the North American Plate. The impact angle in this part of the Aleutians is 90 degrees. The Aleutian Trench sits offshore some 250 km to the south. Given the subduction zone, this region is subject to megathrust earthquakes. The most recent was 1957 to the west of the island. There is evidence that western Unimak Island did not rupture during this quake. The 1946 earthquake and tsunami also present a problem, as there is some dispute as to the cause of the earthquake and the tsunami. On one side of the dispute we have a proposed ruptured section of the trench in a megathrust earthquake. Magnitude of this is earthquake is projected as a M 7.4 rather than mid-M 8’s. This presents a problem as it is not large enough to cause a tsunami as large as it was (M 9.3). The alternate solution is that there was a subsea landslide triggered by a small earthquake. That debate continues. 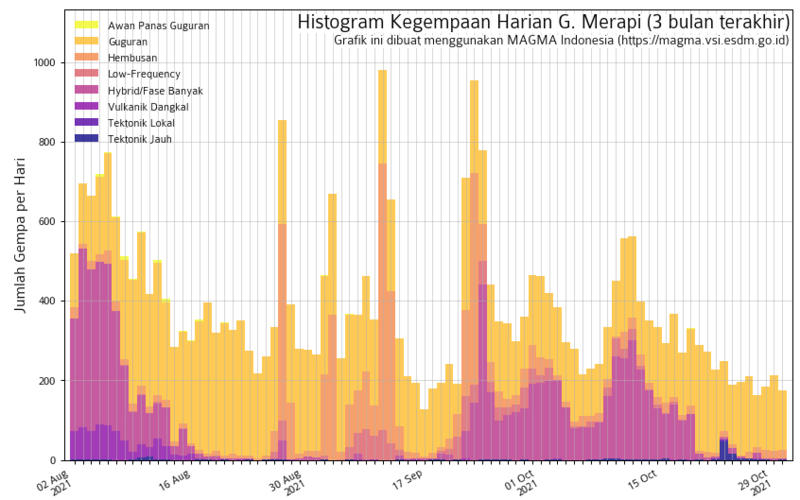 GPS monitoring has shown inflation of Westdahl volcano 1998 – 2001. At the same time, Fisher has subsided a bit. Neither change is tied to tectonics. Rather, magma movements into and around the magma reservoirs is thought to be the cause. 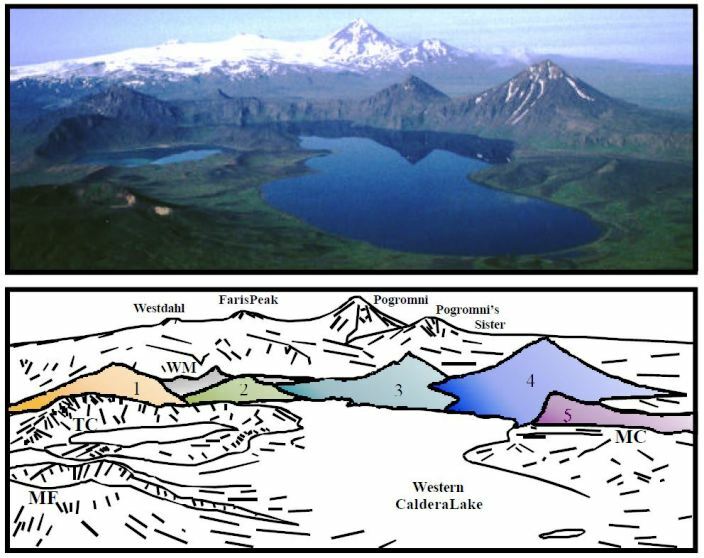 One of the mechanisms for the Aleutian caldera outbreak following the end of the last great ice age is thought to be the removal of kilometers of glacial ice overlying the peninsula and islands as the ice age ended and things warmed up. As the magma chambers decompressed, a series of caldera forming eruptions took place. While this theory is out there, I found nothing in any of the Fisher information tying the eruption to the end of the last great ice age, although the southern pyroclastic fall and flow deposits are on top of glacial till from the last ice age. Thickness of the ice cap on Fisher during the last glacial maximum was 300 – 500 m.
One of the things Fisher has done was to help define how a caldera system operates. On one end of the spectrum, you have a large, shallow magma chamber that differentiates and stratifies. It is somehow destabilized starting with a small eruption that may start a chain of events that will lead to the collapse of the unsupported roof and caldera formation. This can form ring vents and circular collapse features. Recharge of the chamber afterwards will repeat the process. Alternate methods will inject an unusually large magma batch into a shallow reservoir. This sudden overpressure and subsequent removal of the pressure via eruption will also form the caldera. Fisher may represent another end of the spectrum, where no large magma chamber is present. Fisher had a series of smaller stratocones with small, discrete reservoirs. Intense fracturing of the subsurface after injection of a large, compositionally diverse magma destroyed the infrastructure, creating a dense network of fractures. The Fisher caldera forming eruption was the only catastrophic eruption of this system. It is unclear exactly what the current magma system looks like underneath the volcano. On the one hand, if the system originally had multiple independent magma chambers that were connected by fragmentation of the overlying rock during the magma injection that led to the caldera forming eruption, at least two of those chambers still remain under Turquoise and Mount Finch. On the other hand, the remaining magma chamber does not appear to be a large, shallow reservoir. High crystal content of southern dacite suggests an extended residence in a shallow magma reservoir. 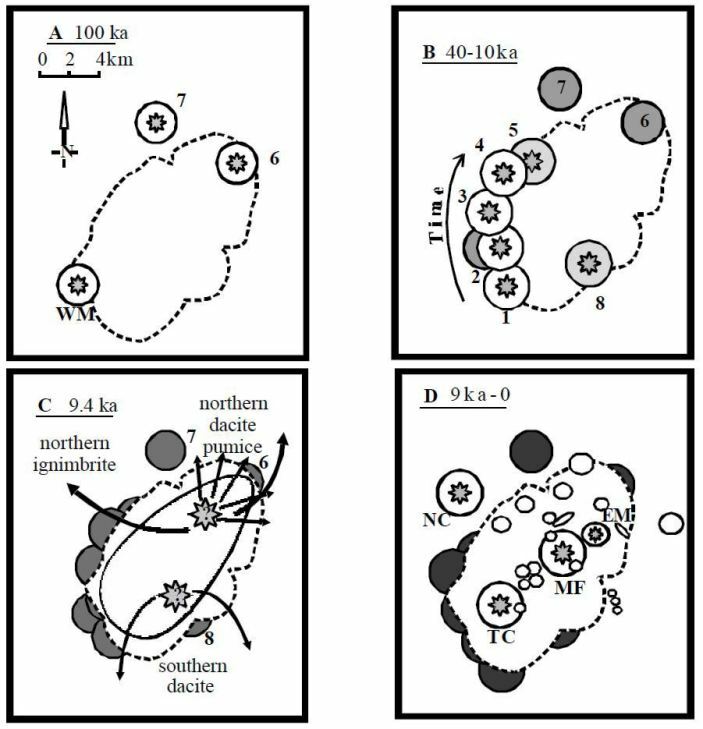 Northern magmas have little crystallization, suggesting that they were erupted soon after arrival below the caldera. The northern andesite rose rapidly through the crust and into the system immediately before erupting. Modification of underlying magma systems due to the first caldera forming eruption is not uncommon. This has been observed at Newberry Caldera, Deception Islands, Kuwae Caldera, and Sierra Quemada Caldera. All of these have multiple pre-caldera volcanic centers. The first caldera eruption was exceptionally large. Post caldera volcanic activity takes place along structural features within the collapse area. Post caldera volcanic activity looks like it comes from a single magma reservoir. 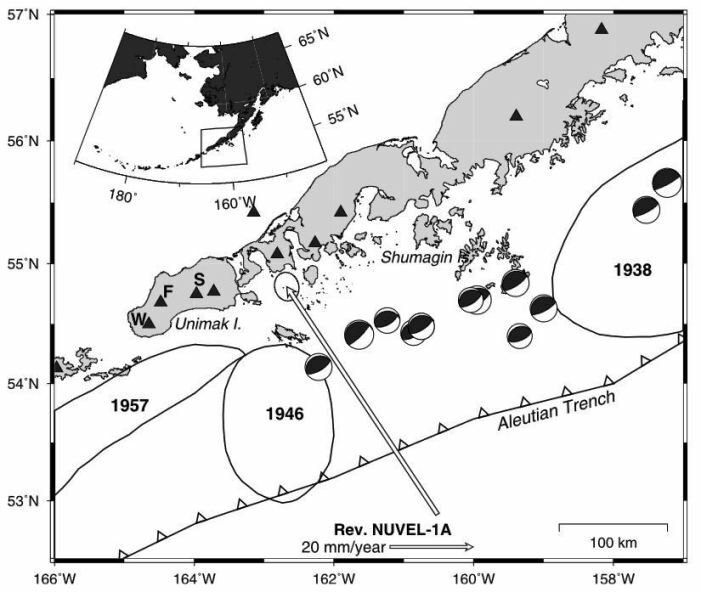 The Aniakchak eruption 3,400 years ago is similar to that of Fisher with the injection of a large pulse of magma into a resident andesite chamber. 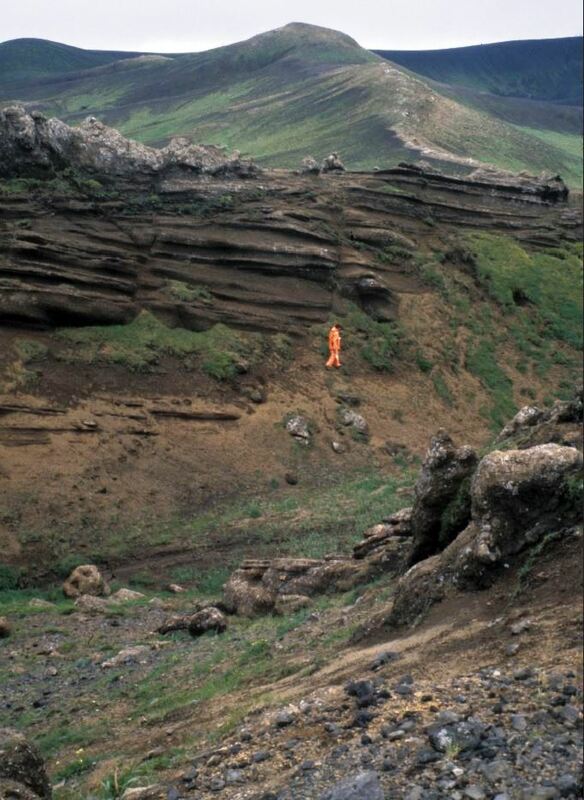 Aniakchak returned to frequent eruptions of small volumes of magma that demonstrate simple mixing. Eruption of multiple magmas during a caldera forming eruption seems to be a common occurrence among caldera forming events. The only relationship between the magmas is that they erupted at the same time. Fisher Caldera is a large, complex, active system. It erupted a significant amount of varied material. In doing so, it behaved like other Alaskan caldera systems, Aniakchak and Katmai – Novarupta for instance. It remains active with vigorous hydrothermal systems. While there is still some discussion about the actual structure of the magma system underneath the caldera, I tend to support the notion that there is a single reservoir, at least for a while after the caldera forming eruption. If nothing else, the continued recent activity of neighboring Westdahl and Shishaldin suggest that this dangerous part of the Aleutians will continue to be so for the foreseeable future.